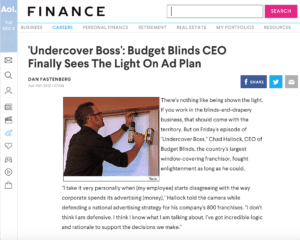 In case you missed it, Budget Blinds CEO Chad Hillock was featured on a 2012 episode of Undercover Boss. It’s been a popular episode of the program. Many of our customers have called us right on the heels of watching a re-run of the show. It’s a privilege to be connected to such a great organization and we take our service of you very seriously. Here is a write up in AOL Jobs about the episode. Hopefully you will be able to catch a re-run of it sometime soon! We are very satisfied with our newly installed room darkening blinds in our home. Scott fitted and help select right style and colors for our rooms. They are affordable, attractive and well functioning. Can’t understand why I never got darkening shades prior, a must in Colorado. Julian installed them perfectly in our wood framed windows. Julian was professional and so helpful. They even said if we get stuck reinstalling batteries in our remote they would come back and help us. I highly recommend Scott and Budget Blinds.